Millennium Recycling No Mattresses Allowed In The Bin. No Mattresses Allowed In The Bin. 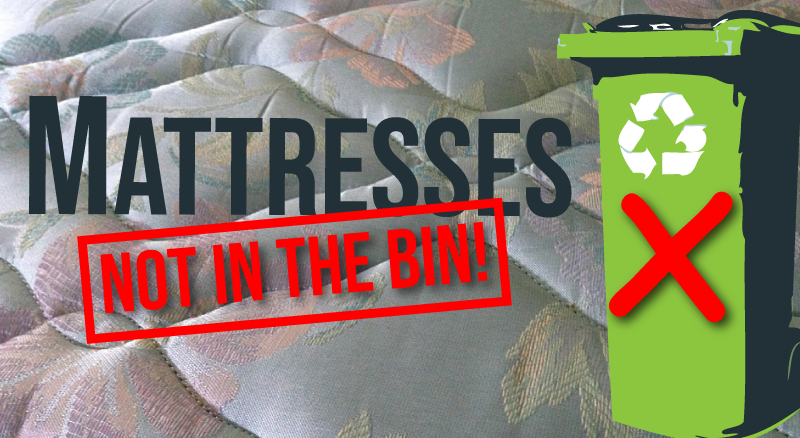 Mattresses are not allowed in your recycling bin, whether its Memory Foam, Gel, Pillow Top, Inner Spring, Water Bed, Air Bed, Latex or a Mattress Topper… none of these can be recycled in the single stream. Please Keep Mattresses Out of the Recycling Bin. Our equipment automatically sorts out single stream items like paper, cardboard, plastic and metal containers…. we do NOT recycle mattresses. Mattresses require specialized processing very different from the single stream process. When they come into Millennium they cause damage to our equipment, waste time trying to pull them out, and can even injure employees when they break or have to be pulled out. WHAT TO DO WITH A MATTRESS? Landfill Recycling Dropoff: Mattresses and box springs accepted for recycling (fee may apply). More details. Local Company Dropoff: Support a local company and find a dropoff point through the Bye Bye Mattress program’s search tool. Your Waste Hauler: Many waste haulers offer mattress pickup if you ask (fee may apply). If you don’t have a hauler or are in the market for a new one, check out the Sioux Falls hauler directory. Manufacturer Programs: Contact your mattress manufacturer and ask about recycling programs. Some manufacturers will take old beds through buy-back or disposal agreements. Check your warranty or visit their website for information. Reuse Options: Give your mattress or topper to a friend or family member. Post an ad online. Donate your mattress to a local charity or local organization like homeless shelters or thrift stores. You can even find a reuse option for yourself, like padding under your sleeping bag for camping trips. WHY NOT JUST DUMP IT? Each mattress can take up as much as 40 cubic feet in a landfill – which is a big deal when trying to maximize the lifetime and save taxpayer dollars. Mattresses also aren’t very eco-friendly. Their decomposition can lead to the release of hydrogen cyanide, isocyanates, and flame retardants which can harm the environment. If sent to a specialized processor, most valuable materials can be saved. Steel from the springs can be melted down and reused, foam can be made into carpet padding, wood can be turned into wood chips for mulch, and fabric can be reprocessed for things like filters for industrial equipment. Have something else you’re not sure about? Use our handy Where Do I Take This tool to search the database of local places you can recycle almost anything! If you don’t see what you’re looking for, just ask us! We love to hear your questions and if it’s not listed in our database, your questions help us add it to the list for others to see. There are 0 comment. on "No Mattresses Allowed In The Bin."